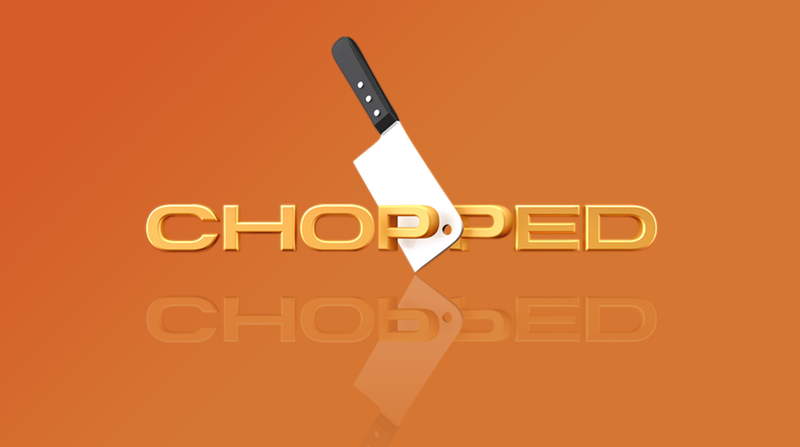 I am obsessed with Chopped! Obsessed! If you don’t know the show on Food Network: Four contestants cook against each other – appetizer, entrée and dessert. In each round they will get a basket with four mystery ingredients that they have to use in their dish. And believe me, the ingredients are craaaazy. Think chocolate cheese, tuna casserole, testicles, salty licorice… they have limited time (20 minutes for appetizer, 30 for entrée and dessert) and in the end three judges (all professional chefs) try and criticize their dishes. One chef is chopped in each round, the winner goes home with $10,000. Not bad, right? If you don’t mind testicles and licorice…. So, I watch it whenever I can, and after they announce the secret ingredients I pause and think about what I would do with them. So what lays closer than playing some Chopped at home and have my dear husband eat whatever concoctions I happen to create? 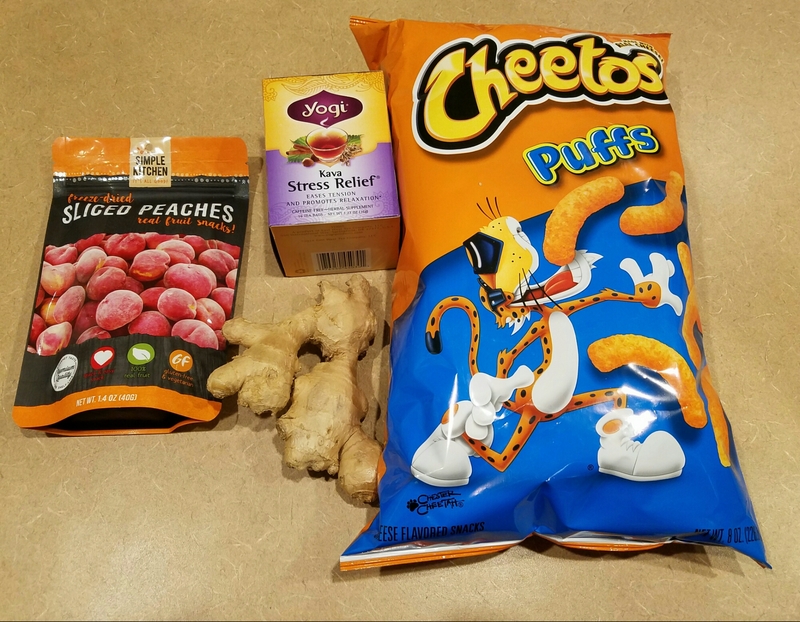 He was absolutely into that and drove to the store to get the mystery ingredients and he had way too much fun picking out some weird stuff. He warned me it will be a hard challenge for me, and he delivered. So what did my beloveth husband get us for a delicious and very special 3-course meal? 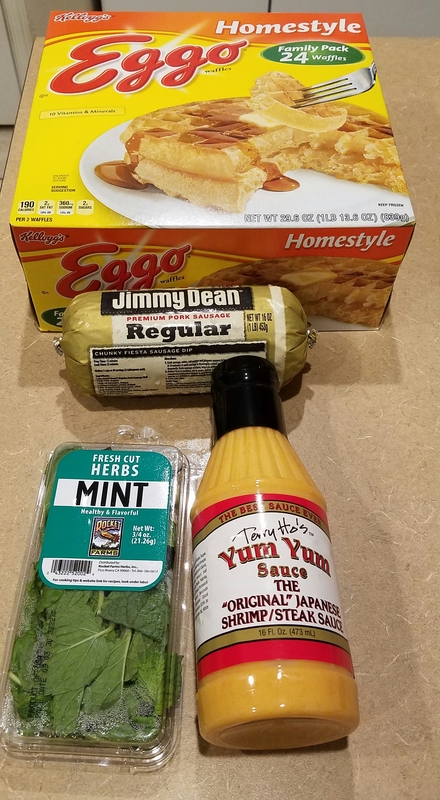 Frozen Eggo breakfast waffles, pork breakfast sausage, fresh mint and Japanese sauce. Wow. Did he realize that he had to try what I cook? Well, as I don’t want my poor man to suffer too much I did my very best to come up with something good. I baked the waffles in the oven and sprinkled them with some red pepper flakes to make a spicy waffle. Yes, kind of lame, but those waffles are unpredictable in how they react to being ground or fried, so I kept it simple. (That’s how we will call it now. Not lame but “I kept it simple!”). The mint was chopped and put into the sausage, along with lots of Asian spices like ginger, garlic, cumin, then I added bread crumbs for more binding, rolled tiny meat balls and fried them in some bacon grease. I wanted a fresh and crisp element so I made a quick apple slaw with some more mint, olive oil and date balsamic. That will become a staple in my kitchen now, it was too good! 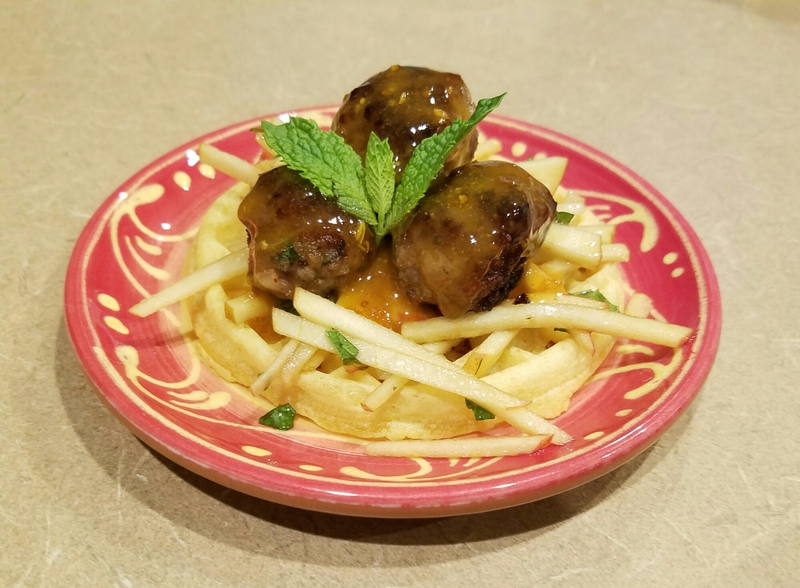 I loaded slaw and meat balls onto the waffle and drizzled it with the sauce which I heated and made more interesting with some orange peel. And here is the dish! It even looks kind of fancy! Well, husband enjoyed it very much actually! He took the role of a real Chopped judge and said I could have transformed the waffle a bit more but as I said, I had no idea how that weird waffle thing would react to anything else than baking. Anyway, round 1 did not get me chopped! 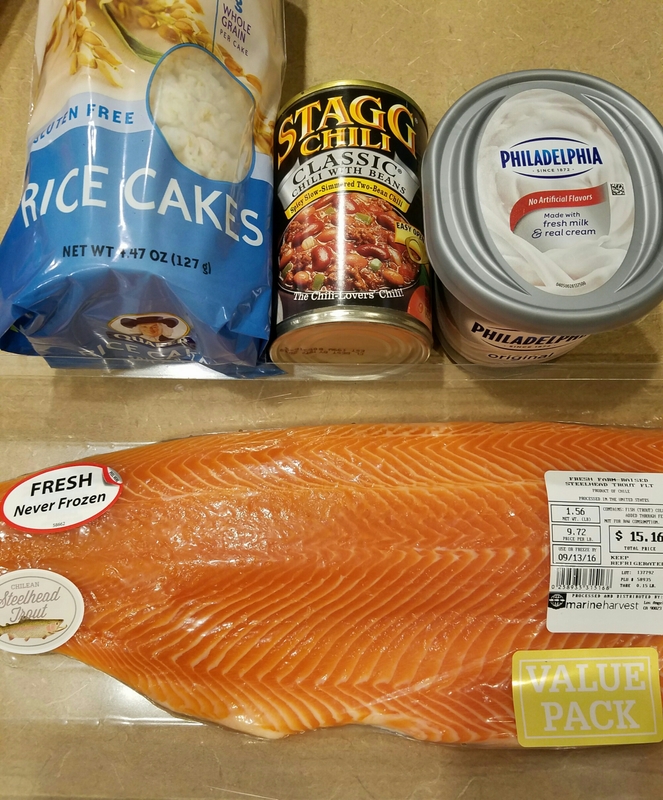 Rice cakes, canned chili, cream cheese and fresh steelhead trout (how did we never get that before? I freaking love trout!). So I felt confident when I saw fish, rice cakes and cream cheese but canned chili? Eeeeeew. Ew. Okay, I wanted to make it work so I jumped right into it. 30 minutes put on the timer aaaaand… run, run, run! I fried some very thinly sliced potatoes in some more bacon grease, because I didn’t want to bother cooking boring rice, which seems to be the one and only side for dish that most people think off. I wanted crisp and bacon fat, so crispy taters it was! I cut two pieces off the fish (the rest will be used tomorrow, that was one ginormous fillet!) and fried them skin down in some olive oil. The rice waffles and some chili were blended to crust the fish, which I count as a rather good idea to be honest, as it turned out very well! I put the crusted fish into the oven to finish it and make the crust, well, crusty. For a side I made a sweet corn and cream cheese puree with some saffron. I decorated the puree with fresh bell pepper for some crunch and color. The puree turned out a bit too liquidy but tasted pretty good! Now here is the entrées dish! The fish surprisingly turned out perfect, guess it was my lucky day. My initial plan was to cut the skin off in the end and fry it really crispy to top the dish with it, but I didn’t have the time. 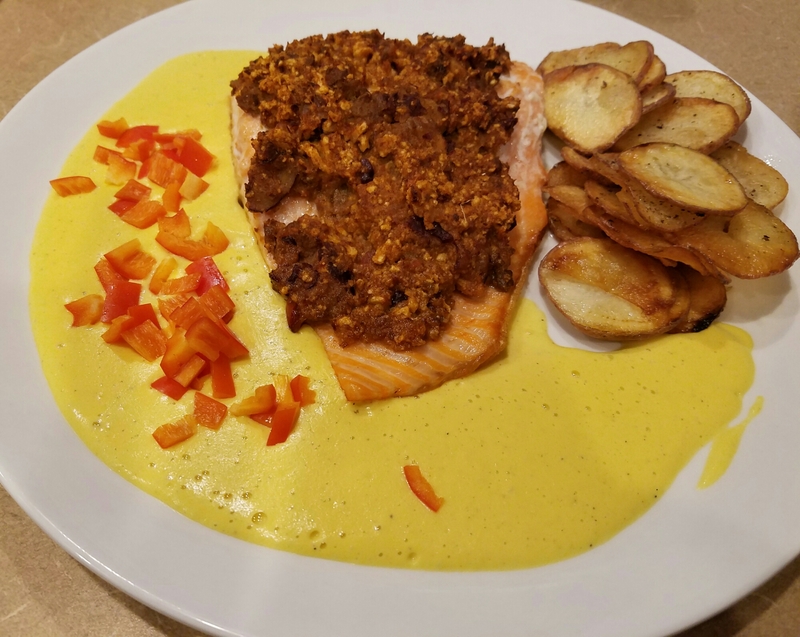 However, we both like the dish a lot, and I have to remember the idea of crusting fish with rice waffle and something else (just not chili again, I mean it was good, but if I can chose something else….). So, the dessert. He really got me with this. I asked myself again if he did know that he will have to try a dish with these ingredients. See yourself…. I failed. At first. I wanted to make a crust with them for a little tarte. I blended them, added butter and sugar, formed a dough and put it into tiny ramequins. In the oven they went and 10 minutes later I saw that this would not work at all, too much butter. So I took them out, scraped the Agent Orange colored goo out of the ramequin and decided to use it as a crumbly crispy topping instead. I added more Cheetos and sugar and hoped for the best. I thought, what do we often eat with cheese? Grapes! What do we have in the fridge? Delicious Moondrop grapes! Crisp and juicy and very flavorful, so I hoped they will balance out the Cheetos cheese stench. I cut them up, added some brown sugar, put them into the ramequins, topped them with the Cheetos crumble and back in the oven they went. The tea I just cooked in some water, and after it was infused with the (by the way very tasty) tea I added the freeze dried peaches, let them absorb some liquid and blended it all to make a syrupy sauce. For a crazy element I finely diced up some fresh ginger and added it to some heavy cream along with brown sugar. My beloveth Kitchen Aid turned that into a ginger and brown sugar whipped cream, perfect to top the grape crumble. But, well, my second fail for the dessert was that I went over my allowed time of 30 minutes. Just about two tiny minutes though. Luckily this was not the real show so I did not lose my chance to win 10,000 fantasy dollar! I sprinkled some dried ginger on the whipped cream because it did not turn out as gingery as I wanted. 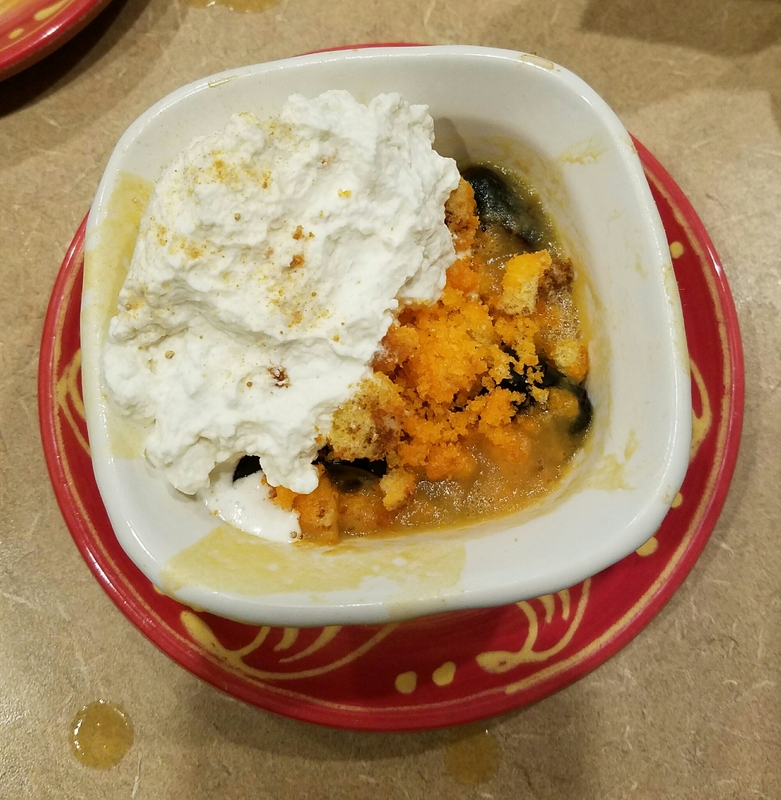 The tea and peach sauce I poured around the edge of the crumble to let it drip between the grapes so it didn’t make the Cheetos crumble soggy. When I served it my husband looked a bit sceptical. I guess that was the moment when he realized that the Cheetos might not have been the best idea. But! I freaking made it work! I surprised myself but it tasted really good! The grapes with the syrup were just the right amount of fruity, spicy and juicy, and despite being baked the grapes were still firm. The cream was delicious. Luckily I made way too much so I could just spoon it out of the bowl (lucky future fat me!). And my dear man also liked it! I won 10,000 non existent fantasy dollars and never ending fame in this house! Yes! The whole Chopped game was so much fun, I can’t wait to do it again. My husband is the next one to cook with mystery ingredients and I will not let him get away easy, I promise! My Song of the Day today is KONGOS – Come with me now because I heard it in a commercial today and wanted to dance immediately!